What's great about these mini beer mugs, is that they are unisex. Both men and women can enjoy these beer favors, without a hangover. 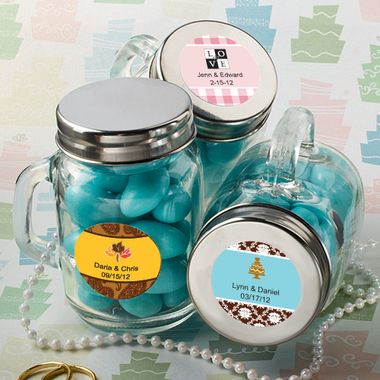 That's because these tiny beer mug favors are filled with candy or other treats. Each four-fluid-ounce-capacity glass jar measures 3 ¼” tall x 2 ½” wide including handle and has a classic mason jar shape with a handle and a removable screw-on round silver metal cap for a tight seal. 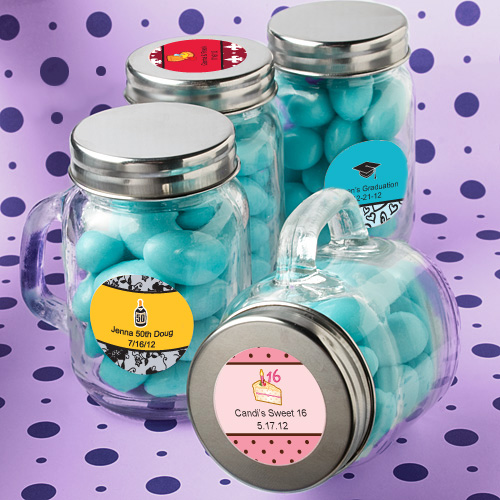 The top or front of each jar is perfectly fit for the application of the personalized label of your choice. The labels come on sheets for you to apply - the jars are bulk packaged. I was hesitant to order because the description didn't say if the mugs were glass or plastic. Well, I did order for a "Daddy Baby Shower" and the glass mugs are perfect and the label printing is high quality. Highly recommend!